In the late 1920s, the Victor Talking Machine Company offered a prize of $25,000 for "an outstanding serious composition for orchestra." The result was a five-way tie. 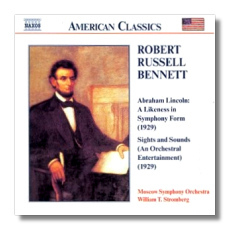 The winning works were Copland's Dance Symphony, Gruenberg's Symphony, Bloch's Helvetia, and two works by Robert Russell Bennett: Abraham Lincoln and Sights and Sounds. Only Copland's work is played with any frequency today. These new recordings of Bennett's scores are real ear-openers, however, and it wouldn't surprise me if some American orchestras took them up again on the strength of this new recording. Bennett was born in Kansas City in 1894. After coming to New York, he landed jobs at two prominent music-publishing houses, and he quickly became known as a top-notch orchestrator and arranger for the musical theater. For example, he orchestrated Richard Rodgers's score for South Pacific, and later, he arranged an expert "symphonic scenario" of the show's music - work that was highly characteristic of him. He certainly is less famous for his original compositions, but there's no reason for the neglect, as Naxos shows us here. Abraham Lincoln: A Likeness in Symphony Form is in four movements: "His Simplicity and His Sadness," "His Affection and His Faith," "His Humor and His Weakness," and "His Greatness and His Sacrifice." The movements roughly correspond to those of a traditional European symphony, and the titles are highly descriptive, making further commentary about the music almost superfluous. Bennett's sincerity is touching, and there's no denying that this score is a great accomplishment. Bennett, like Dvořák in his "New World" Symphony, does not quote from actual American folk tunes; the music is nevertheless American to the core: plain-spoken, warmly sentimental, nostalgic, and even a little bit naïve. The fact that it could portray George Washington as well as Abraham Lincoln hardly seems to matter. What surprised me more is the music's occasionally Elgarian overtones. Sights and Sounds, while more metropolitan in focus, is hardly less innocent. Its seven movements depict "Union Station," "Highbrows," "Lowbrows," "Electric Signs," a "Night Club," a "Skyscraper" (tellingly marked Adagio religioso) and "Speed" - the last is apparently not a virtue to Bennett. These are the musical equivalents of word- or pen-sketches in The New Yorker. They poke gentle fun at the pretentions and perils of city life and city-livers. Bennett's music is airy and entertaining. It requires no excuses. Stromberg and the Moscow Symphony Orchestra are competent advocates for Bennett's music; they play it with warmth and affection. The engineering also is serviceable. One might hope for a major orchestra's attention to these scores in the near future, but this Naxos disc is more than just a stopgap. It is yet another release in that label's increasingly interesting "American Classics" series.